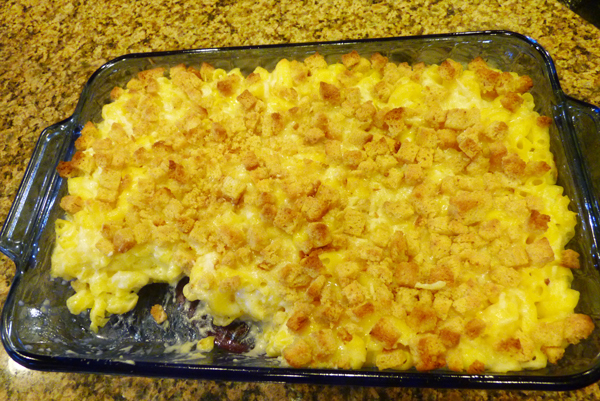 Who doesn’t love a great pan of macaroni and cheese? This was another of the “hard” foods to give up going GF. So I went on a quest looking for that “perfect” recipe. I must say that Martha doesn’t disappoint on this one. This makes a TON of mac-and-cheese. Even with our family (5) we still had plenty of leftovers. Which of course did not last more that a day! Half the recipe would be plenty for one meal. My favorite part of this dish is the bread crumbs on top. I love the crunchy buttery flavor and texture. The cheese sauce? Fantastic, it would also be great in a crockpot used for dip with veggie’s, bread, crackers etc. (I just used a spoon)! turned out to be fine. Combine the dish with a crunchy salad and veggie and you have the perfect meal. Preheat oven to 375°F. Butter a 3-quart casserole dish; set aside. Place the bread in a medium bowl. In a small saucepan over medium heat, melt 2 tablespoons butter. Pour the melted butter into the bowl with the bread, and toss. Set the breadcrumbs aside. Warm the milk in a medium saucepan over medium heat. Melt the remaining 6 tablespoons butter in a high-sided skillet over medium heat. When the butter bubbles, add the flour. Cook, stirring, 1 minute. While whisking, slowly pour in the hot milk a little at a time to keep mixture smooth. Continue cooking, whisking constantly, until the mixture bubbles and becomes thick, 8 to 12 minutes. Remove the pan from the heat. Stir in salt, nutmeg, black pepper, cayenne pepper, 3 cups cheddar cheese, and 1½ cups Gruyère (or 1 cup Pecorino Romano); set the cheese sauce aside. Cover a large pot of salted water, and bring to a boil. Cook the macaroni until the outside of pasta is cooked and the inside is underdone, 2 to 3 minutes. Transfer the macaroni to a colander, rinse under cold running water, and drain well. Stir the macaroni into the reserved cheese sauce. Pour the mixture into the prepared dish. 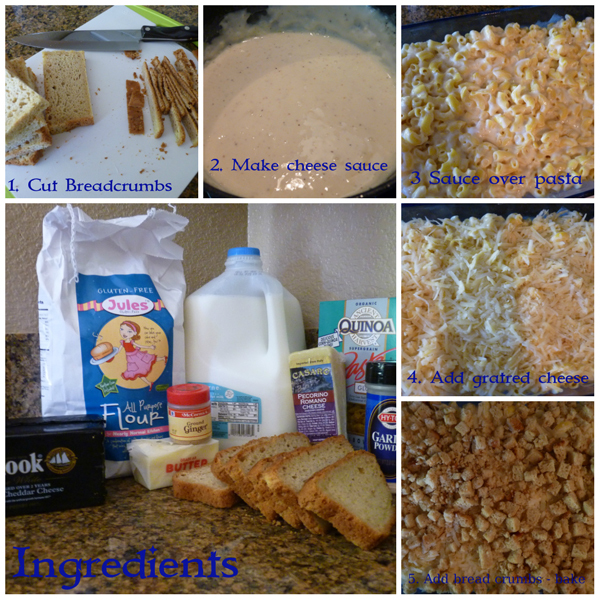 Sprinkle the remaining 1½ cups cheddar cheese, ½ cup Gruyère (or ¼ cup Pecorino Romano), and the breadcrumbs over the top. Bake until golden brown, about 30 minutes (though we needed a bit more time to get it brown, but your oven may vary). Transfer the dish to a wire rack for 5 minutes; serve. « Clean your toilet with Coke?